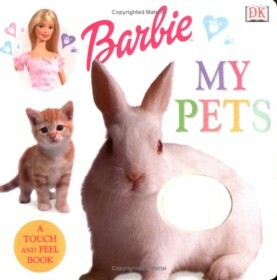 Barbie Touch and Feel: My Pets is a book in the Children genre written by Dorling Kindersley Publishing. The book was published by Dorling Kindersley Children on 2003-02-01 and contains 12 pages. The book has an ISBN number of 978-0789492326. Our users found the overall impression of this book to be Educational. A nice fun book with interactive elements. This is another of my Nieces favourite books and it features “touch and feel” fur and skin as well :). The main draw of this childrens title is the touch and feel nature of the book but as an added bonus this book also appeals to girls as it features Barbie. On each page of the book Barbie tells your child to pet the rabbit etc and the book features nice colourful and bright pages with barbie in various poses. The authors kept the words to a minimum as to not confuse your child. Overall the book is pretty good but I do wish it was longer and had a few more animals.